The next specs that allow the car to be seen from far are the front and back bumpers. The front and back bumpers come in a chrome color, and they especially shine in the sunlight. 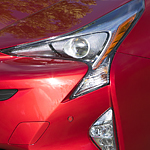 These bumpers give a higher status to the Prius, and they allow people to travel with less worry.